Chief Election Commissioner of India T. S. Krishnamurthy said here today that nominated officers would not be allowed perform election duties during the Assembly polls in Haryana. 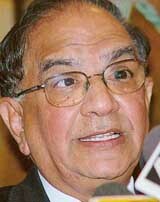 Haryana Opposition parties today urged Chief Election Commissioner, T S Krishnamurthy to bring into force the model code of conduct and stop Chief Minister Om Prakash Chautala from luring voters by announcing doles for various sections of the population. INLD general secretary and Rajya Sabha MP Ajay Singh Chautala has threatened to launch a statewide agitation against the hike in the prices of cocking gas, kerosene oil, diesel and other petroleum products. The Indian National Lok Dal (INLD) has opposed the likely hike in LPG, kerosene oil and diesel prices by the Congress-led UPA Government at the Centre. The BJP will ensure its victory in the coming Vidhan Sabha elections by virtue of its sincere and hardworking party workers. Haryana Chief Minister Om Prakash Chautala's sop opera continues unabated with the state Cabinet today approving fresh populist measures. The Haryana Bhartiya Kisan Union chief, Mr Ghasi Ram Nain, today launched a campaign to win back former loyalists who had deserted him in the recent past. Due to poor storage management of wheat crop by Hafed in the home district of the Chief Minister, Mr Om Prakash Chautala, the state exchequer had suffered a loss of over Rs 1 crore. Dr Raj Vir Singh, officiating Director, National Dairy Research Institute (NDRI), has said the sustainable agriculture is the need of the hour as mechanised and intensive farming has deteriorated natural resources like water and soil in addition to increased pollution. An illogical condition imposed by Maharshi Dayanand University is threatening the careers of students whose results have been declared late by the university following the re-evaluation of their answer sheets. A galaxy of educationists, research scholars, social activists and feminists has descended on the Haryana Agricultural University campus here. The guests have come from various parts of the country as well as abroad to attend a conference on globalisation and women’s work going on at the HAU College of Home Science. The performing art of good music was globally acknowledged as the greatest indication of love and friendship. It could play a major role in promoting peace and harmony among the masses across the border. A party of the local CIA Staff impounded a truck carrying 5,000 kg of poppy husk valuing Rs 30 lakh in the open market yesterday and arrested three persons in this connection. However, their two accomplices jumped from the truck and fled. The court of the Additional District and Sessions Judge, Mr V.K. Bakshi, here has sentenced four persons to life imprisonment and acquitted one person giving him benefit of doubt. Aloke Dutt, a 46-year- old marginal farmer of a nearby village having a land holding of 10 acres, is successfully taking up the propagation and cultivation chrysanthemum flowers for the past 13 years. Two girls of a Dalit colony, who were crossing the Sharanpur – Ambala rail line near Pansera village here, were killed after being hit by a train this morning. The girls, who had gone to answer the call of nature in the nearby fields, probably could not see the approaching train because of dense fog. US-born Mrs Anita Bajwa, who spent the sixth consecutive day on the footpath outside her estranged husband's bungalow in Ambala Cantonment, has sought the assistance from the United States Embassy. Defence estate officials are investigating the suspected excessive felling of trees along the airbase at Ambala Cantonment. Trees were to be felled for the construction of the periphery of the airbase. A total of 117 trees had to be felled to clear the way for construction of the new periphery. Haryana Governor, A.R. Kidwai administered the oath of office and secrecy to Mr Ram Kumar Kashyap as member of the Haryana Public Service Commission at a ceremony in Haryana Raj Bhawan here today. Haryana Chief Minister Om Prakash Chautala today laid the foundation stone for a new grain market along the GT road near Ambala Cantonment. Mr Chautala said that the Congress was anti-farmer and had sought the help of the rich during the Lok Sabha elections. The State Bank of India, Ambala city branch, organised a blood donation camp at MM Medical College & Hospital, Mullana, yesterday. State Bank of India, (SBI), Ambala city branch, completed 83 years of service to the community on December 12. About 150 donors donated blood at the camp. A colourful programme was presented by the children of Kharga Nursery School in Ambala cantonment today. Lt General GD Singh and Mrs Mina G.D. Singh were the chief guests at the programme held at Kharga auditorium. He said by nominated officers he meant officers who had been nominated to the state civil services during the tenure of the present government. It is understood that the CEC's words, when translated into action, would lead to transfer of the nominated HCS officers who had been posted as SDMs and were functioning as Returning Officers of the Assembly constituencies. Mr Krishnamurthy, who was talking to reporters here today about preparations for the Assembly elections in Haryana, added that prior to assembly elections there would be also reshuffling of officers to shift officers who were serving at a particular place for a long duration. “We are expecting all the officers to conduct themselves in an impartial manner at the time of the elections. Ruthless action would taken if an officer showed any bias. On the other hand we would encourage and protect an honest officer”, Mr Krishnamurthy said. He said he had taken note of a complaint regarding letters, promising enhancement of old-age pension in case of the INLD's return to power, being distributed by government officers to old-age pensioners. He said an administrative officer should not involve himself in such activities which were political in nature. Mr Krishnamurthy said in all 90 Assembly constituencies of Haryana, there would be one central observer each to ensure that the model code of conduct was being observed by all contestants. There would also be a state-level Central observer who would act as coordinator of the constituency observers. The CEC said paramilitary forces would be deployed in the state well in advance so that its "dominance and presence could be felt by the public" and the voters could cast their votes without any fear of threat. Despite repeated questions, Mr Krishnamurthy refused to indicate the possible date for the elections and said the date would be announced “very soon”. He said polling would take place in the entire state during a single day. While fixing the date, school exams taking place in the middle of February would be kept in mind, the CEC said. On the possibility of the panchayat elections interrupting the schedule of Assembly elections, Mr Krishnamurthy said any clash of programmes of the two elections would be avoided. He added that they had a plan to tackle any problem that could arise out of the announcement of the date of panchayat elections by the state Election Commission. He, however, refused to divulge anything about the “plan”. Mr Krishnamurthy came down heavily on the Chief Minister, Mr Om Prakash Chautala, for announcing various sops to allure the voters. “I am told that there was not even budgetary sanction for some of the projects being announced by the CM. However, the voters are intelligent and they are not likely get carried away by such tactics”, he said. He said he had also received complaints about criminals being let off on parole for their use in the elections by the ruling party. “Apparently, these elements were not observing the conditions of parole. I have told the state government officers to send such characters back to prison, if necessary”, the CEC said. Earlier, he met the Chief Secretary, the Director General of Police and others and took stock of the state government’s preparations for the elections. He also met representatives of five political parties and listened to their views about the situation prevailing in the state. A memorandum submitted by the Congress to the CEC here today sought immediate announcement of the poll dates and introduction of the model code of conduct. It also said that a permanent state election observer should be deputed at the state capital immediately. The memorandum, copies of which were distributed to reporters later at a press conference addressed by HPCC working president, Mr Randeep Singh Surjewala, officiating CLP leader, Capt Ajay Singh Yadav and other Congress leaders, also sought deployment of paramilitary forces during the entire process of elections. It also urged the CEC to issue direction to the state Election Commission to hold panchayat elections after the conclusion of the Assembly polls. The Congress also urged for posting of central observers in all 90 assembly constituencies in the state. The memorandum also urged that recruitment being made against unsanctioned posts on contract basis must be immediately stopped. The Congress also submitted a list of 11 constituencies to the CEC and expressed fear that the CM would try to sabotage the election process in these constituencies. The constituencies are Narwana, Palwal, Tosham, Naggal, Adampur, Kiloi, Rewari, Meham, Pai, Rori and Bhattu Kalan. The BJP, too, made similar demands while it also accused Chief Minister Om Prakash Chautala of getting a large number bogus voters enrolled in the electoral list. It urged the CEC to order an inquiry by a neutral agency to probe the matter and take action against the officers involved in preparation of fraudulent voters list. The Bahujan Samaj Party said polling booths for the scheduled caste and backward voters should be set up at areas where such people were having a strong presence. It also urged the CEC to hold elections in February and keep a strict watch on poll expenditure of the contestants. The CP(M) urged the CEC to announce the dates of the elections at the earliest and also take steps so that the panchayat elections were not held before the assembly polls. From the ruling Indian National Lok Dal also a three-member delegation met the CEC. Later talking to reporters, Mr Sampat Singh, Finance Minister, who was part of the delegation, said they told the CEC that all its instructions were being complied with by the state government as well as by the ruling party. Mr Ashok Arora, Transport Minister and Haryana INLD president, said they told the CEC that three general elections had taken place in Haryana since the INLD had come to power. “We told him that there was no major incident of violence in any of these elections”, Mr Arora said. INLD general secretary and Rajya Sabha MP Ajay Singh Chautala has threatened to launch a statewide agitation against the hike in the prices of cocking gas, kerosene oil, diesel and other petroleum products. Opposing the statement of Union Petroleum Minister Manishankar Aiyer in Parliament, he said that the INLD would not accept any such anti-people policies and an agitation would be launched. Mr Chautala was addressing people at Kakroli Sardara village in the Badhra area in this district during a public contact programme late yesterday. He said that the real face of the Congress at the centre had been exposed with the statement of the Union Finance Minister given in connection with the withdrawal of subsidy on domestic gas and kerosene oil. The statement showed that the Central Government was going to increase rates of these commodities, he said, adding that actually subsidy was not provided and this was all magic of figures only. Mr Chautala said that the prices of crude oil in the international market had fallen but the government had not adjusted the increased prices of petrol, diesel, kerosene, oil and kitchen gas accordingly. He said that the INLD workers would expose the government’s farce before public. He further said that Haryana had achieved the status of number one state in the country during the present rule of the INLD. Lashing out at the Congress, he said that its leaders were still busy in infighting. Mr Chautala inaugurated a boosting station constructed at the cost of Rs 54.12 lakh at Kakroli village, besides a senior secondary school at Kakroli Hukmi village. Dr Vasudev Sharma, Chairman, Public Enterprises bureau, INLD district president Ranbir Mandola and Additional-Deputy-Commissioner J.P.S Dahiya were among others present in the meeting. In a statement issued here yesterday, the secretary-general of the INLD and Rajya Sabha member, Mr Ajay Singh Chautala, warned that his party would launch a mass agitation on this issue. He was reacting to the statement of the Union Finance Minister, Mr P. Chidambaram, on the need to curb the subsidies on kerosene and LPG gas. He said the INLD would not accept any such anti-people step of the Central Government. He attacked the UPA Government for its mid-year review proposals for asking “doing away the subsidy on the LPG and kerosene”. He termed the subsidy as "jugglery of statistics" and said that virtually there was no subsidy being given to the poor people. He asked the UPA Government to not to try to mislead the general public by first putting up customs and excise duties and doubling the prices of petro products and then reducing it a bit on the pretext of subsidy for the poor. Mr Chautala asked the Central Government to exempt crude oil from the customs and excise duties as it was 'the foundation of progress and economy’. He said hike in diesel and petrol have a chain reaction and results in inflation across the country. He said the public had recognised the truth behind the so-called pro-poor policies of the Congress in the short span of its six months rule and ‘its anti-people face has been unmasked’. He said that the people would never forgive the Congress for the 'ill-treatment' meted out to poor people. The BJP will ensure its victory in the coming Vidhan Sabha elections by virtue of its sincere and hardworking party workers. This was stated by the BJP legislator party leader in Vidhan Sabha Krishan Pal Gujjar. He was addressing a workers’ meeting at Bhagwati Dharmshala here today. The meeting was presided over by district unit president Tara Chand Agarwal. He said each worker should put his efforts on the both allotted to him. He said there would be a direct contest between the BJP and the Congress as the Chautala government was taking last breath. He alleged that inflation had gone up rapidly after the formation of the Congress government. On the SYL canal issue he said Haryana’s interests had been hit during the Congress rule in the state and the statement of in charge of Haryana affairs in Congress, Mr Janardan Dwivedi, that the SYL was not an issue in Haryana, proved about the policies of the Congress party. He said Haryana Congress had opposed the implementation of Vat in state whereas it was implementing it in the entire country thereby betraying the people. The Cabinet today decided to permit sale of municipal lands to old occupants who had encroached upon it and constructed tenements up to March 31, 2004. The occupants would be charged for the cost of land at the collector rates plus development charges as applicable on regularised colonies. It was decided that the municipal council or municipal committees would pass a resolution to this effect and this provision would be applicable in those areas where the Deputy Commissioners were satisfied that roads were wide enough for the movement of vehicles, especially fire tenders. The Cabinet approved a proposal of the Excise and Taxation Department to reduce the rates of assessment fee of rum and whiskey from Rs 15 and Rs 30 per bulk liter to Rs 6 and Rs 24 per bulk litre, respectively, when supplied to troops through Canteen Stores Department. The decision would provide a relief of Rs 1.30 crore to the troops during the remaining period of the current financial year. The Cabinet decided to waive off the amount of excess local calls made from residential telephones of ministers, Mr Sampat Singh and Mr Jaswinder Singh Sandhu. The decision was reportedly taken since it was felt that the ministers had made the excess calls in public interest. The government had imposed a ceiling of 40,000 bi-monthly local calls on the residential telephones of ministers. The Cabinet also approved a proposal of the Urban Development Department to repeal the existing Punjab Town Improvement Act, 1922, and to enact a new legislation — the Haryana Town Improvement Act — which would be in harmony with the related Acts like the Haryana Urban Development Act,1975, the Haryana Urban Development Authority Act,1977 and the Punjab Schedule Roads and Controlled Areas Restriction of Unregulated Development Act,1963. The Cabinet approved a proposal of the Animal Husbandry and Dairying Department to transfer a piece of land measuring 8 acre, 4 kanal and 2 marla belonging to Government Livestock Farm, Hisar, to CCS Haryana Agricultural University, Hisar, free of cost. It was also decided to transfer unused vacant land measuring 2700 sq. yards and belonging to the Industrial Estate, Gurgaon, to the Dakshin Haryana Bijli Vitran Nigam. The nigam would utilise this land for construction of sub-divisional office of industrial area, Maruti sub-division, Gurgaon, 11 KV switching station and a complaint centre so as to provide better services to the consumers. This land would be transferred to the nigam free of cost. He claimed at a press conference here late this evening that all office-bearers of the Rohtak district unit of the union including Mr Dharambir Hooda, who had quit the union a few months ago, rejoined the BKU at a Hooda khap panchayat held at Kiloi village near here this morning. Mr Hooda was present at the press conference. The panchayat was headed by Mr Surat Singh who presented a pagri and a purse of Rs 21,000 to Mr Nain. Although former Rohtak BKU chief Gopi Ram was not present today, Mr Nain claimed he had been held up somewhere because of certain urgent personal business. He said Mr Gopi Ram had also rejoined the BKU. Both Mr Nain and Mr Hooda claimed that a breakaway faction of the BKU, headed by Mr Dharam Singh, would also realign with the BKU shortly. Investigations revealed that Hafed, the state government crop-procuring agency, had left the wheat in the open. In the absence of sufficient godowns in the district, the agency is keeping the wheat in the open exposing the foodgrains to the vagaries of nature. According to the Food Corporation of India (FCI) norms, shelf life of the wheat lying in the open should not be more than six months. But due to negligent attitude of the local Hafed officials, stocks are lying in open for the past more than five years. Though Hafed was procuring wheat till this season, the officials forgot about the old stock. According to sources, the FCI has rejected a huge consignment procured by Hafed due to poor quality as it was unfit for human consumption. The agency has a total stock of 1 lakh tonnes of wheat of which the FCI has refused to buy 16,000 quintals of wheat valued at Rs 1.12 crore. The District Manager, Hafed, Mr O.P. Singhmar, confirmed the rejection of wheat stock by the FCI due to poor quality. He said the department had initiated inquiry to look into the reasons that caused massive loss to the state exchequer. In this regard, he added, certain officials had been served notices too. He admitted that the procuring agency lacks sufficient place to store the food stock. Talking to TNS, he said the rejected consignment was as old as five years. Polythene sheets spread to cover the stocks also not changed over the years causing severe damage to the grains, he added. Owing to the fluctuating market, there was demand from other states too resulting to the piling up of stocks in the open. According to Mr Singhmar owing to the lack of the space such losses were inevitable. There was sufficient space in the permanent godowns but nothing could be done, as the rules do not permit shifting the stocks twice, he added. He was addressing scientists and teachers of Haryana Agriculture University (HAU), Hisar on the concluding day of a two-week training programme on planning and management for sustainable agriculture organised at Krishi Vigyan Kendra (KVK) of the NDRI here, yesterday. He stressed that farmers should realise the mixed farming system of crop and dairy husbandry as the intensive use of fertilisers and irrigation had called for the policy makers to think on the lines of sustainable agriculture. He exhorted scientists to develop new technologies requiring low inputs maintaining productivity and the farmers to practice the judicious blend of modern and traditional farming so that the natural resources were conserved for the future generations. Commenting on the content of the training programme especially designed for scientists, Dr Raj Vir Singh said such programmes need to be frequently organised so that the developed eco-friendly agro-technologies were shared by scientists. Dr J.C. Markanday, Head of KVK, during his address said that during the training programme participants from regional stations of HAU located at Uchani and Kaul were told about the latest concepts and dimensions of sustainable agriculture. He said the participants were demonstrated for recommending various enterprises of dairying, bee keeping, fisheries, horticulture, vermi-compost making to attain sustainable farm production. Mr Dalip K. Gosain, co-ordinator of the training programme, said for the past two decades the issue of sustainable agriculture had drawn the attention worldwide. He said with the introduction of organic farming, which was gaining momentum, it would hopefully be easier to achieve the overall sustainability of agriculture. Dr P.S. Oberoi, a senior scientist of the KVK, said that the re-cycling of crop residues and the scientific dairy farming in the mixed farming system could enhance the sustainable agriculture production. During the training programme, Dr V.K. Pandita, Dr Rakesh Seth of Indian Agriculture Research Institute (IARI), Dr R.S Chokar, Dr R.P.S. Verma from the Directorate of Wheat Research (DWR), Dr Saroj Jaipal from the regional station of HAU (Uchani), Dr H.P. Tripathi, Dr A.K. Chakaraborty, Dr Aruna Chabra and many other experts interacted on various issues for attaining sustainable agriculture. An illogical condition imposed by Maharshi Dayanand University is threatening the careers of students whose results have been declared late by the university following the re-evaluation of their answer sheets. According to the admission procedure and regulations circulated by MDU to affiliated colleges if as a result of re-evaluation a candidate passes the examination or is placed under compartment, he/she may be allowed admission to the next higher class only if he/she is able to complete at least 50 per cent of the total lectures/practicals delivered in the class and a seat is available and he/she is otherwise eligible”. The second condition stipulates that “such a student will also be required to attend 75 per cent lectures to be counted from the date of actual admission. Such admission may be granted within 10 working days from the date of despatch of detailed marks certificate after re-evaluation”. A number of students applied for re-evaluation in July last after they were declared unsuccessful in the examinations. In many cases the students passed the examination after the re-evaluation. However, their fresh results were declared about 10 days ago. The university took more than four months to declare the results during which such students could neither seek admission to the next higher class nor attend lectures. As per rules they can now seek admission and also hope to attend 75 per cent of lectures delivered from the date of their admission. However, there is no way they can hope to comply with the condition of attending 50 per cent of total lectures delivered from the start of the academic session. This means that they will not able to take the final examination in April next. Renu of Hindu Girls College, Sonepat, is one of those affected. She passed the B.Com part I examination after re-evaluation of her answer sheets. The detailed marks certificate was issued by the university on December 4. However, since there is no possibility of her meeting the condition of attending 50 per cent of the total lectures delivered, she faces the prospects of wasting one year for no fault of hers. Her father Mr Ranbir Singh said his daughter was declared fail because of incompetence of the examiner otherwise there was no way she could have passed the examination after re-evaluation of her answer sheets. “Where is Renu at fault? If the MDU takes four months to admit its fault and allow her admission, why is she being asked to meet a condition that the varsity knows cannot be fulfilled?”, he said. MDU officials say Renu has one option. She can appear in the final examination by enrolling with the Directorate of Distance Education. However, there is a rider. If she does that she will have to pass her B. Com part III also from this directorate. This effectively means she cannot join a college next year also. Renu objected to this condition saying this would deprive her of attending a college and learning by distance education was not the same as attending a college. She said this condition was being imposed as the university wanted to earn the hefty fee it charged from the students of the Distance Education Directorate. 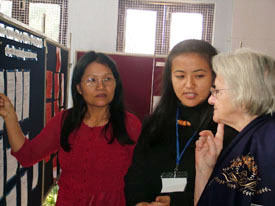 The Dean of the Home Science College, Dr Savita Singal, said unique feature of the conference was a separate poster session on each theme. A number of participants, including faculty members from various universities across the country, put up a cluster of posters on a given theme to make their point with the help of suitable illustrations and tables. Today’s theme was “Women in agriculture, food security and sustainability”. Dr Swarna S.Vepa chaired the session and spoke on feminisation of agriculture and marginalisation. She observed that due to lesser interest of the young generation in agriculture, the participation of women in farm operations was increasing. Still, the women got much less economic gains from farming, she added. Dr Anita Jhamtani delivered a speech on information technology to empower farm women for livelihood and nutritional security. She emphasised the importance of knowledge for women. Dr Promila Sharma discussed women’s contribution to the development of agriculture and related issues in the mountain regions of Uttaranchal. She lamented that despite being an integral part of the agricultural system, the women of these regions had no access to the latest technology. In the evening the delegates went on a visit to the nearby Agroha township, Kajla and Kuleheri village. They interacted with several home-based women entrepreneurs and appreciated their efforts despite tough circumstances. These views were expressed by artistes from Pakistan who came along with a delegation of 120 Pakistanis, comprising intellectuals, journalists, academicians, artistes, businessmen and farmers, to take part in an international seminar on “India-Pakistan relations: emerging cooperation” that concluded here on Monday evening. Famous Pakistani singer Shaukat Ali Khan, who performed here last night, conveyed the message of love and friendship between the two nations through his ghazals. “Waghe die sarhadde teinu tatti waa na laghe” performed by him was the one that was most admired by the audience. It reflected the emotions, sentiments and desire of the people from the other side of the border for peace and re-developing the social relations with their brothers and sisters on this side of the border. Emotions came out naturally from the singer and at one time it appeared that his eyes were full of tears. Later, talking to The Tribune, he said both the nations were required to take steps to further improve the peace process. Artistes from both the countries should perform on each other’s soil so that people-to-people contact could be further encouraged. Another noted Pakistani classical singer Riaz Ali Khan said: “We should have more programmes like these, especially those that convey the feelings of love and friendship”. According to Superintendent of Police Ranbir Sharma, the police laid a naka on the Ambala road on getting information that a truck carrying contraband would pass through the route. The police party headed by Inspector Amrik Singh noticed a truck and signalled it to stop. Two persons jumped from the truck on noticing the police party. However, three others identified as Joga Singh, truck driver and resident of Chhota Jhoom (Kurukshetra), Mandeep and his brother, Gurmit, residents of Bhana, were overpowered by the police. During search of the vehicle the police found 125 bags of poppy husk concealed under bags of sand . The two, who fled from the spot, were identified as Rishi Fauji of Keorak and Gurlal Singh of Tilheri . The police has registered a case under Section 15/61/85 of the NDPS Act. The SP said that the accused had procured the poppy husk from Dewri in Rajasthan and were carrying it to Pehowa area. According to information, Yash Pal of Kakot village in this district had lodged a complaint with the police on July 4, 1999, that his brother, Dariyaram, left his home the previous day but did not return till late evening. However, next morning some residents of the village reached the house of Yash Pal and told him that his brother was murdered by Jagdish, Sohan Lal, Sanjeev, Surinder and Suresh with knives and dandas following some altercation. They also said that after committing the crime, the accused had buried the body in a field. The police registered a case under Section 302, 201 and 34, IPC, and found the body of the victim from the field of Dhan Singh, one of the accused. The court sentenced Sohan, Jagdish, Surinder and Sanjeev to life imprisonment. A pioneer example of 100 per cent diversification of his land holding from traditional crops to cultivation of chrysanthemum flowers, he gains more profits as compared to the traditional crops. While taking to The Tribune at his farm on the national highway just opposite to the headquarters of the Haryana Armed Police at Madhuban, 10 km from here, he said:" I have earned Rs 5 lakh from flower cultivation in 10 acres of land during the last financial year as net profit, which otherwise, was not at all possible." He is presently growing at least 20 types of cut-flower varieties of chrysanthemum flowers, 15 types of multi-coloured chrysanthemum flowers used in making garlands and many types of large chrysanthemum flowers to propagate them in the gardens of big houses in the cities. He says: " The saplings of these varieties of flowers are planted for three months from July to September-end in accordance to their climatic survivability and the harvest is taken continuously from October to April-end." In reply to a question, he admitted that cultivation of crops is risky because market rates fluctuate daily but even in sluggish marketing conditions " I have earned at least Rs 50,000 per acre per annum from chrysanthemum cultivation". The highest one could earn in increased demand market conditions is something around Rs 3 lakh per acre, he said. However, it requires a lot of labour efforts to cultivate and then sell these flowers in the market, he said. .
Mr Dutt said that the biggest advantage in cultivation and transportation of chrysanthemum flowers is that it has a vase life of around three weeks, which provides ample time to the farmers to cut, preserve, pack and then transport the flowers to even remote markets. According to another version, at the time of the accident, there were trains on both up and down lines. The bodies were noticed by a signalman at 10.05 am ,who in turn reported the matter to the Stationmaster. It was not yet known which train hit the girls. The accident had took place sometime between 9 am and 10 am near the signal No. 218. The deceased have been identified as Lakshmi (17) and Deepmala (15). According to police sources and residents of Pansera village, Lakshmi had gone to a nearby field for defecation. While she was returning home, Deepmala met her on the way. Lakshmi went back to the field with Deepmala. It is being presumed that the accident took place while the girls were returning . Lakshmi was a class XII student and was also perusing a computer course. Her father, Gurnam Singh, is a daily wage labourer. Deepmala was a Class VIIIth student and daughter of a tailor. Mrs Bajwa said despite her plight, the police had failed to redress her grievance. “I am disheartened and I am planning to return to Rishikesh tomorrow,” she said. The state unit president of the Christian Front, Mr Shaukat Masih Bhatty, said he would submit the letter written by Mrs Bajwa at the US Embassy. “Besides her letter, we will also be submitting another letter on our behalf. We have pointed out the unfortunate circumstance in which Mrs Anita Bajwa finds herself in," he said. Mr Bhatty said the letter stated that Lt Col (Retd) Bajwa and Anita Bajwa were married in 1991. “They have not been divorced as yet and her husband is not ready to receive her. So, she has to stay on the footpath outsider her husband's bungalow,” he said. He said they had not received any help from the district administration. “We are demanding that proper help should be provided to Mrs Anita Bajwa and she should be given her due rights,” he said. A resident of Mall Road observed that while the contractor had axed most of the trees, some of the trees were left untouched. “On the pretext of cutting those leftover trees, the contractor has attempted to remove excess trees on the sly from within airbase,” he alleged. An official said they were investigating the incident. He said the tractor-trailer of the contractor had been stationed at the DEO office. “If we find that excess trees have been felled by the contractor, heavy penalty will be imposed on him,” he said. It may be recalled that a similar incident had taken place a few weeks back in which a few persons allegedly tried to axe green trees within Ambala Cantonment. A demand had then been made to conduct an inquiry into the incident. The Chief Minister, Mr Om Prakash Chautala, with his Cabinet colleagues, Deputy Speaker, Haryana Vidhan Sabha, Chairman and members of the Haryana Public Service Commission and others were among others present on the occasion. Born on March 6, 1951, Mr Kashyap is an MA in economics and LL.B. He has been working as field assistant in the Economic and Statistical Organisation, Haryana. Mr Chautala said that ever since the Congress government was formed at the Centre, the prices of goods like cement, iron, petrol, diesel and LPG had shot up. Ambala Cantonment MLA Anil Vij said that as the old grain market was within the Sadar area, people had to face hardship. He said that there had been a 40-year-old demand to shift out the grain market. He said that 10.20 acres of land had been provided for the new grain market and 44 shops would be constructed. Mr Vij said the mandi would be ready in nine months. Mr Mrinal Shanker, Deputy General Manager, SBI Zonal Office Haryana, lauded the gesture of the SBI Ambala city branch. He appealed to the student community to motivate people for donating blood. Mr Shanker said the SBI is a pioneer in banking services and in community services banking. He added the SBI has been playing a pivotal role by organising blood donation camps, adult education camps, cleanliness drives in slums and free health checkup camps for the poor. Among others, Mr Y.P. Sharma, Asst General Manager, and Mr S.K. Dharni, Chief Manager, were present on the occasion. School headmistress Mrs Asha Aggarwal highlighted the achievements of the school in the annual report. Students displayed talent through variety programmes. General G.D. Singh appreciated the performance.